There are plenty of ways Mac users can get the latest weather forecast. For example, Mac OS X includes its own weather widget for Dashboard, and there are many third-party weather programs out there. (And that’s not including the myriad iPhone apps.) But I’ve found that the best place to view weather forecasts is on my calendar. After all, doing so puts the weather in the most-appropriate context: where I’ll be and what I’ll be doing. For those who use OS X’s iCal—or any calendar program that syncs with iCal, for that matter—Bare Bones Software’s new weather-data client WeatherCal makes it dead-simple to get the weather onto your calendar. WeatherCal works as a System Preferences pane; open it, and you’ll see a list of locations to be monitored. 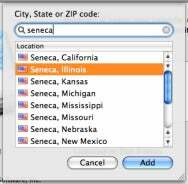 To add a city, you just click on the add (+) button, type the name of the city, select it in the list that appears, and click on Add. To remove a city, select it on the main WeatherCal screen and then click on the remove (-) button. WeatherCal checks for updated forecast information every hour, automatically updating your calendar “events” with any changes; previous days’ forecasts are automatically deleted so they don’t clutter up your calendar. 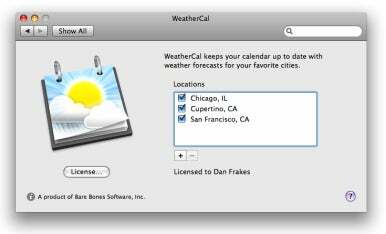 Because WeatherCal uses Leopard’s CalendarStore, iCal doesn’t have to be running for such updates to occur, and any changes WeatherCal makes can be synced immediately to any devices or other Macs you’ve set up to sync with iCal. This means that the forecasts for all your chosen cities also show up in the Calendar app on your iPhone or iPod touch when you sync those devices with iTunes. And if you’ve got a MobileMe account—which syncs iCal changes to your iPhone immediately—the forecasts on your iPhone are always up-to-date as long as your Mac is running. WeatherCal creates a new iCal calendar for each city (top) and creates an all-day event for each city's forecast (bottom). It’s worth noting that WeatherUnderground.com provides roughly similar functionality: When you look up a particular location on the Web site, that city’s page includes a tiny ICAL button. If you right-click on this button and choose Copy Link, then switch to iCal and choose Calendar: Subscribe, and then paste the URL into iCal’s Subscribe To Calendar box and click on Subscribe, you’ll get a new subscribed calendar that, much like WeatherCal’s calendars, periodically updates with the latest weather forecast. This approach even gives you a bit more detail—each weather event’s notes include a summary of the day’s forecast. On the other hand, this process is clearly more involved than adding a city in WeatherCal; you don't get WeatherCal’s useful icons for the day’s conditions; and subscribing to Weather Underground’s iCal feed for a location means your forecasts are updated only as often as iCal requests updates—which doesn’t happen if iCal isn’t running. In addition, subscribing in this manner depends on Weather Underground to update the iCal feed, whereas WeatherCal gets data directly from the regularly-updated Weather Underground site. In other words, with WeatherCal, you’re paying $10 for reliability and ease of use. Although WeatherCal was designed to be as simple and easy to use as possible, there are a few features I’d like to see. For example, there are times I don’t need hourly updates; it would be useful if I could choose how often WeatherCal updates my forecasts. It would also be great if WeatherCal added a calendar alarm whenever a significant weather event occurs, so I could be alerted, for example, if there’s a flash-flood warning or a tornado watch in my area. That said, this is the initial release of WeatherCal, and it’s tough to beat for ease of use.